Born in 1911 in Avlona, Attica, Yorgia Mitaki enjoyed a singing career that lasted thirty years. She came to Athens at the age of eighteen and married in 1930. Although she is remembered mostly as a singer of dimotika tragoudia, she was just as accomplished with Smyrnaeika, singing compositions and arrangements of Panayiotis Toundas, Spiros Peristeris and others . It is she we hear on the first recording of the young Vasilis Tsitsanis,'S'ena teke boukarane'- click above to play mp3. She made two highly successful tours to the USA, one in the late 1950's, the other in the early 1960's. Her health began failing, however, and by 1965 she had made her last visits to the recording studio. 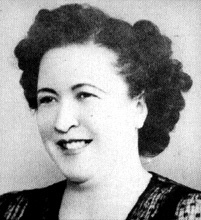 Yorgia Mitaki died back in her 'horio', Avlona, on 28 February, 1977.